Statements from the Pakistan army’s media wing have described General Bajwa as being outspoken in conversations with American generals and government officials. In a call this month with Gen. Joseph L. Votel, the head of the United States Central Command, for example, General Bajwa talked of a “sense of betrayal” within the country over Mr. Trump’s tweet, the army said. The relationship between Pakistan and the United States has been one of “allies with an up and down history,” said Maj. Gen. Asif Ghafoor, the spokesman of the Pakistani military. Since the announcement from the Trump administration, General Bajwa has stressed that Pakistan will not seek the resumption of American security aid and that the country is not dependent on it. Since last year, he has been reaching out to countries like China, Iran, Qatar, Russia and Saudi Arabia — building contacts that could help him cement his grip on power and reduce Pakistan’s reliance on the United States. Nawaz Sharif, the ousted prime minister, waving to supporters from a car. Since leaving office, he has drawn big crowds at public rallies and, in sometimes veiled and sometimes not-so-veiled references, has accused the judiciary and the military of hatching a conspiracy to remove him from office. In the view of the Pakistan military, both General Bajwa and his predecessor, Gen. Raheel Sharif, can point to victories against militants who have attacked the country’s civilian population, which has increased the army’s popularity. General Bajwa is also pursuing fencing along the 1,685-mile length of the Pakistan-Afghanistan border to help curb cross-border movements by militants. And he has pushed for the repatriation of Afghan refugees to keep militants from hiding in the country by mingling with refugees in settlement camps. 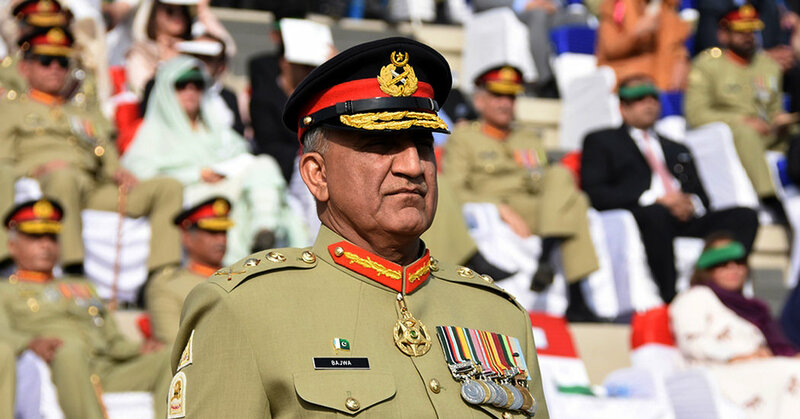 On the domestic front, critics say that General Bajwa is essentially following the same institutional policies that have made the military an overarching influence in the country. Since being removed from the prime minister’s office, Mr. Sharif has gone on a political offensive. He has drawn enormous crowds at public rallies and, in sometimes veiled and sometimes not-so-veiled references, has accused the judiciary and the military of hatching a conspiracy to remove him from office. The military has denied accusations that it is behind Mr. Sharif’s removal, but allegations of the military’s intelligence agencies meddling in politics continue to surface. Recently, Shahid Khaqan Abbasi, a Sharif loyalist who succeeded him as prime minister, hinted at the role of intelligence agencies in forcing the resignation of an ally of Mr. Sharif from the post of chief minister of Baluchistan Province in the country’s southwest. There is speculation within the governing party, the Pakistan Muslim League-Nawaz, that the military will not allow a level playing field in the next general elections, which are five months away. There are also worries that the vote may be delayed. A military parade in Islamabad, Pakistan, last year. “For the last one and a half years, civilian-military ties have hit their lowest ebb,” said Zahid Hussain, a widely read political columnist. Mr. Hussain, the political columnist, echoed that sentiment, saying fears of a coup or delay in elections were exaggerated. “I don’t see any derailment of the democratic process,” he said. One of the country’s leading opposition politicians, and a bitter foe of Mr. Sharif, raved about the job the new army chief has done. Mr. Khan, a contender to be Pakistan’s next prime minister, said General Bajwa had doubled down on his predecessor’s efforts to curtail militant violence and political corruption. As an example, Mr. Khan pointed out that there had been suspicion among the business community of Karachi, the country’s commercial hub, that actions started by the former army chief against criminal political gangs and extortionists in the city might come to a halt. “But there has been no letup,” Mr. Khan said. The relationship between Mr. Sharif and General Bajwa fractured this past spring over leaks to the news media of a meeting at which Pakistan’s civilian leaders confronted the military over its alleged reluctance to fight Islamist groups in the country. The army chief is said to have a better working relationship with Mr. Abbasi, Mr. Sharif’s successor.